Yes, you have my permission to use this photo in any way you choose, as long as you provide photo credit to me, JD Hancock. Want details? Read more! "No Cameras!" is licensed under a Creative Commons Attribution 3.0 Unported License. Permissions beyond the scope of this license may be available. Posted to Flickr on 01 July 2009. Part of the Stormtroopers series. Photo seen in Flickr Explore. Would you like to use this photo on your blog, news website, presentation, or other project? All of the photos here are licensed for free use under a Creative Commons attribution license as long as you credit me, JD Hancock. Really! Ready to use this photo for free? This photo was posted to Flickr on 01 July 2009. It was one of 500 images featured on Flickr Explore for that day. The last time I checked, it had 9,019 views on Flickr. The media type of this image is "photo." The original file type was "jpg." The photo's dimensions are 1024 x 768, giving it landscape orientation. Unless otherwise noted, the image was created by me, JD Hancock. The stormtrooper is the elite soldier of the Imperial forces in the Star Wars universe. They typically wear white armor and helmets and are armed with blasters. Imperial stormtroopers were first depicted in the film Star Wars (1977). As shown in the Star Wars prequels Star Wars Episode II: Attack of the Clones (2002) and Star Wars Episode III: Revenge of the Sith (2005), the stormtroopers were preceeded by the clone troopers, an army of soldiers cloned from the bounty hunter Jango Fett and loyal to Emperor Palpatine. 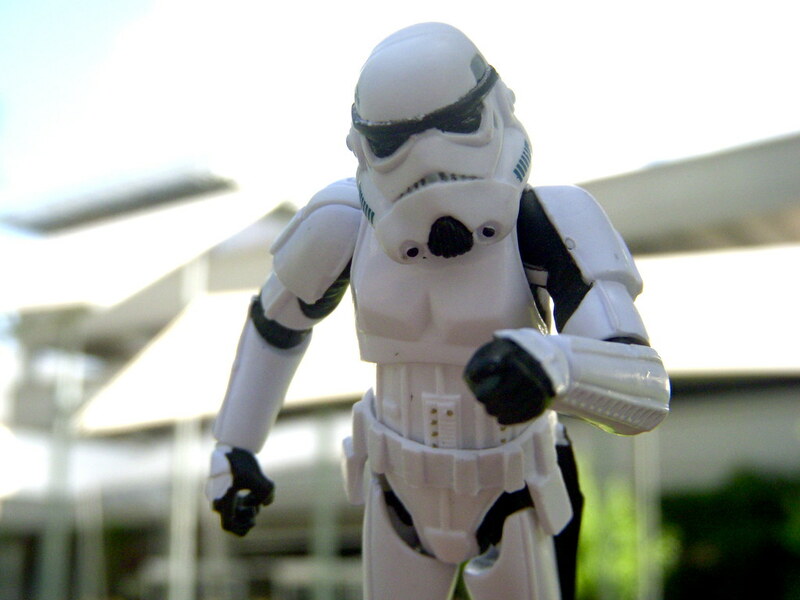 In many ways stormtroopers are an iconic symbol of the Galactic Empire. "No Cameras!" by JD Hancock is licensed under a Creative Commons Attribution 3.0 Unported License. Permissions beyond the scope of this license may be available. "I Hate Easter On The Death Star." "It's Fun To Stay At The ..."